This unique book is designed to help today's podiatrist manage an ever-increasing flow of information. The book's editorial team has studied hundreds of publications—mainstream podiatric journals as well as those from related fields—to hand-pick the most significant articles in each subject area from the last year. Each article is expertly condensed in an easy-to-read, standardized format. This unique subscription-based book is designed to help today’s podiatrist manage and ever-increasing flow of information. The book's editorial team has studied hundreds of publications—mainstream podiatric journals as well as those from related fields—to hand-pick the most significant articles in each subject area from the last year. Each article is expertly condensed in an easy-to-read, standardized format. Accompanying each section is a commentary by one of the journal's section editors, which shows how the information in the article can be applied in practice. Also included are illustrations and key references for further reading. 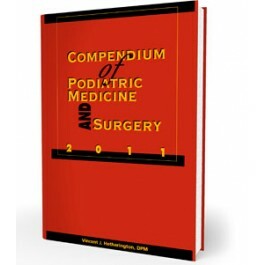 Compendium of Podiatric Medicine and Surgery 2011 is updated on a yearly basis and your subscription is automatic with the purchase of this publication. Subsequent books will be sent to you automatically and billed at the then-current prices. If you do not wish to receive any updates, you must write a letter with your name, company name, address, phone number, and publication, to cancel your subscription. Cancellations may be faxed to 410-494-0515 or mailed to Data Trace Publishing Company at P.O. Box 1239, Brooklandville, MD 21022-9978. Editor-in-Chief: Vincent J. Hetherington, D.P.M. 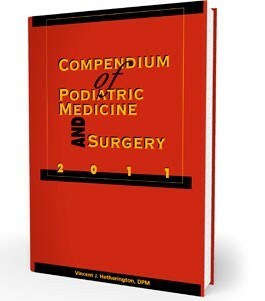 It is my pleasure to serve as the editor-in-chief for the 2011 Compendium of Podiatric Medicine and Surgery. Recent years has seen an increase in the number of journals, as well as articles, addressing all areas of clinical practice relevant to providing comprehensive care of the foot and ankle. This has resulted for many reasons, such as the enormous growth of interest in wound care, the increased interest in physical activity by the general public, the aging population, and the rapid development in the field of biomaterials. The rapid development in bioengineering and biomaterials has resulted in products to enhance wound healing, osteobiologics to enhance bone healing, and improved fixation techniques. Podiatric medicine and surgery is no different than other branches of medicine in that the physician must continually enhance existing knowledge as well as keep abreast of new developments within their sphere of expertise. The Compendium of Podiatric Medicine and Surgery seeks to aid the practicing physician by finding, summarizing, and providing critique of recently published articles that the chapter editors believe to have value for the reader. A variety of formats are reviewed including case reports, reviews, and clinical studies. Because certain subjects may overlap it may also be helpful to review the index to see if similar articles exist in separate chapters. It is difficult to find Level I evidence for all of the articles presented in the chapters. This, however, does not mean that the manuscripts reviewed here are without value. Cohort studies and case series also provide relevant information important to advancing patient care. This is especially true in the realm of surgery where randomization and blinding have proved difficult. I would like to take this opportunity to thank the chapter editors for selecting and critiquing the articles, as well as all those involved in summarizing the articles for presentation in this edition. edited by Lesly Robinson, D.P.M. and Shani A. N. Gilmore, D.P.M. edited by G. Dock Dockery, D.P.M. edited by Erika M. Schwartz, D.P.M., Christina Hamad, D.P.M., and Michael Williams, D.P.M. edited by Sébastien G. Demoiny, D.P.M. edited by Bruce G. Greenfield, D.P.M. edited by Barry Saffran, D.P.M. edited by Pieter M. Lagaay, D.P.M. edited by Vincent F. Giacalone, D.P.M. edited by Vincent J. Hetherington, D.P.M. edited by Kendrick A. Whitney, D.P.M. edited by Andrew J. Meyr, D.P.M. and Chad D. Moorman, D.P.M., C.Ped. edited by Philip J. Bresnahan, D.P.M. and Nicholas J. Pagano, Jr., D.P.M. edited by John S. Steinberg, D.P.M., and Farah Siddiqui, D.P.M. edited by Steven J. Pettineo, D.P.T., O.C.S., C.S.C.S. and Keith C. Fleischman, D.P.M., M.P.T. edited by Kathya M. Zinszer D.P.M.